On a day that had a lot of people talking about meteorites and asteroids, a fireball of some sort was seen streaking across the Bay Area skies. The fireball was seen around 7:45 p.m. There were reports into the newsroom from people as far north as Fairfield and as far south as Gilroy. It was also seen in Sacramento, Newark, Walnut Creek, and St. Helena. It was bluish in color and appeared to be heading straight to the ground, according to one viewer in Santa Clara. Meteors are pieces of rock and metal from space that fall to Earth. They burn up as they go through our atmosphere. The burning is what causes the bright flash of light. "I saw that meteor/fireball over Solano County after spending the day reporting on asteroids and fireballs," said NBC Bay Area reporter Jodi Hernandez. Candice Guruwaiya told us on Facebook she saw it in San Jose. "I was leaving Safeway on Branham and Snell when I saw it. It looked like it was headed for the Capital Auto Mall area. It was a bright green when it first appeared, then it went to a bright yellow. It was awesome!" Guruwaiya posted. It comes on the same night a 150-foot-wide asteroid was due to come within 17,200 miles of Earth. It was not immediately clear if the fireball had any connection to the asteroid. 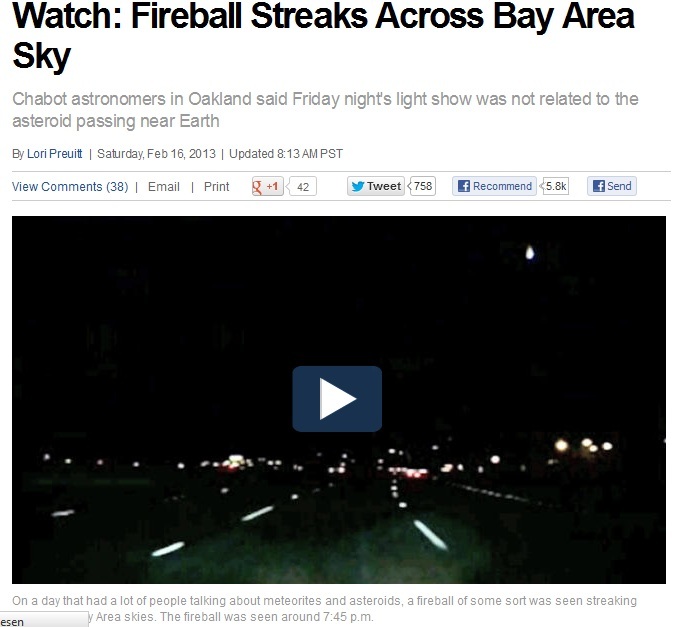 Chabot astronomers in Oakland said the meteor was not related to the asteroid passing near Earth. Astronomer Gerald McKeegan said based on accounts he thinks it was a "sporadic meteor," which can happen several times a day. He told Bay City News that sporadic meteors bring as much as 15,000 tons of space debris to Earth each year. He said it was likely smaller than another meteor that landed in the Bay Area in October, which caused a loud sonic boom as it fell in the North Bay. It also happened about 24 hours after a huge meteorite fell from the skies over Russia's Chelyabinsk region, resulting in a powerful blast that injured nearly 1,000 people and shattered windows across the area. Chelyabinsk health chief Marina Moskvicheva told the Russian news agency Interfax that 985 people in her city asked for medical help and 43 were hospitalized. Many of the injuries were reportedly from broken windows as a result of a sonic boom that followed the initial impact of the meteorite. Someone posted the following on YouTube within an hour of the fireball sighting. The video was titled "Shooting Star across San Francisco 2/15/2013 7:44PM." The person who posted it said he was driving south on I-280 toward the peninsula. HAVANA, Feb. 15 (Xinhua) -- An object fell from the sky over central Cuba on Thursday night and turned into a fireball "bigger than the sun" before it exploded, a Cuban TV channel reported Friday, citing eyewitnesses.